Mountaineer and adventurer Katja Staartjes: “Are you looking for a great speaker to inspire your company? My images and story will capture your hearts and minds. 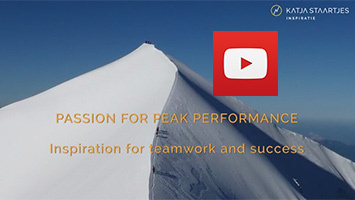 With my background as mountaineer, expedition leader and manager I help your organisation to achieve peak performance. Achieving peak performance requires focus and perseverance. Plus flexibility and cooperation. This applies both to mountaineering as well as to organisations. That’s why I use the intense Himalayan experiences in my speech as powerful metaphor to the great challenges in work. So you can together reach your own objectives and top. I use impressive images from my expeditions to such mountain peaks as Mount Everest (8848 m) to strengthen my story. This visual support ensures that the message makes a stronger and lasting impression. It gives you the chance to really apply my story in your daily lives. If you would you like a great adventure story that inspires please complete the form or call Katja Staartjes (The Netherlands) at +31 6 212 742 82. Request information about a speech, without obligation.